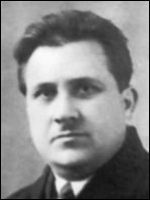 Ses, Pamfil [Памфіл Сесь] – ceramics technologist, writer; born on 16 February 1897 in the village of Kamianka (Amur-Nyzhnodniprovsk district, city of Dnipro, Ukraine; at that time – Novomoskovsk county, Katerynoslav gubernia, Russian Empire); died on 18 October 1992 in Leicester, England, United Kingdom. After completing his secondary education in Katerynoslav (now the city of Dnipro), in May 1916 Ses was called up to the Imperial Russian Army. He attended a junior officers’ school and a military veterinary school, subsequently serving in the Army as a veterinary surgeon. After the establishment of Soviet rule in Ukraine he studied at the Myrhorod Art and Ceramics College, from which he graduated in 1929 with a qualification in ceramics technology. He worked until 1931 in a construction materials research institute in Rostov, then moved to Tokarivka in Volhynia (now Pershotravensk, Zhytomyr oblast) where he worked in a factory producing ceramic insulators for high tension power cables (now the Pershotravensk Electrotechnical Porcelain Plant). In 1933 he returned to Dnipro (then Dnipropetrovsk), where he worked until 1941 in a metals plant. Initially he was manager of a fire-resistant materials laboratory, then became involved in ceramics research and the design of ceramic kilns. He made several inventions relating to the utilisation of fire-resistant materials, published scholarly articles, and received awards for his work. In 1942, during the German occupation of Ukraine, he established his own ceramics workshop in the village of Zhovte (Piatykhatky raion, Dnipropetrovsk oblast) in which he made terracotta and porcelain products for the needs of the village. In collaboration with potters and artists he also produced decorative artefacts. In 1944 he left for Germany and, after the end of the Second World War, in Regensburg, he established a ceramics workshop in which he produced bas-reliefs, figurines and other decorative items. In 1948 Ses came to live in the United Kingdom. Initially he settled in Stoke-on-Trent, where he worked in porcelain factories, and later moved to Leicester. In his free time he produced busts and bas-reliefs of notable individuals from Ukrainian history, as well as ornamental ceramics. He also wrote poetry, and published a two-part story in verse entitled Leleky (Storks; 1960, 1969) and a collection of political poems, Yarema v yarmi komunizmu (Yarema Under the Yoke of Communism; 1961, under the pen name P. Speka). Six other works of his remained unpublished. He wrote many articles, mainly on political topics, which were published in various periodicals including Vyzvolnyi Shliakh, Ukrainska Dumka, Kanadiiskyi Farmer, Ukrainskyi svit, Batkivshchyna and Mitla. He was elected a member of the Governing Council of the Association of Ukrainians in Great Britain (AUGB) in 1954, 1955 and 1956, and head of the AUGB Tribunal (mediation committee) in 1962 and 1963. He was a member of the Ukrainian Hetmanite Organisation (Soiuz Hetmantsiv Derzhavnykiv) in Great Britain.